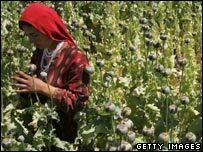 The ban on poppy farming in Afghanistan may hamper the heroin trade but it also leaves farmers in poverty. Kate Clark meets one who has had to negotiate the betrothal of his six-year-old daughter to pay a debt. Jalalabad, near the junction of the Kabul and Kunar rivers, is a green city, shaded by citrus and pine trees. Farmers who live nearby on the well-watered land are weathering the government ban on opium poppy. Further away in the mountainous, outlying districts, the ban is hitting home hard. Three times since 2000, a ban on poppy growing has been enforced in Nangarhar province. Cultivation has always bounced back. But each time, the poorest farmers were left poorer and less able to cope. One man, Juma Khan [not his real name] has come down from his village in the mountains on the Pakistan border. Turbaned, with a white beard and a deeply lined face, he looks old enough to be a grandfather. But he has just agreed to hand over his six-year-old daughter to pay off a debt. She is now engaged to the creditor's son. In a country without banks, opium is the standard way to get a loan. You borrow opium and pay back with opium. While Juma Khan was growing poppies, he could pay off the interest on the debt, although never the capital. The ban means he is having to grow low-value wheat. This year, he will not even be able to feed his family. And because he is landless, his only asset is his female children. He has already exchanged two daughters for debt and now the youngest has wiped off a further $2,000 worth, a huge amount of money in rural Afghanistan. A father here gets paid by the family of the groom, so payment of money is normal at a marriage. The shame for Juma Khan is that he has been forced to marry off his daughter. Weaning Afghanistan off poppy cultivation must be good, you would think. 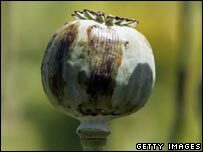 Afghan opium, processed into heroin, causes the deaths of tens of thousands of people around the world each year. It is funding the Taleban insurgency and feeding government corruption. Afghans usually recognise that it is a haram crop, forbidden in Islam, but if your family is facing hunger, they say, even haram crops become acceptable. And here, the poppy has always been regarded as wonderful. In a high risk environment, it is a low risk crop. It suits the dry climate. And even when there is war, there is always a market for opium. And if you grow poppies, you can always get credit. The farmers range from big landowners to subsistence peasants. The really big profits, though, go to the traffickers, the corrupt officials, and in the south, to the Taleban who take a religious tax on the harvest. Even so, there is a real trickle down of cash. Poppy is a labour intensive crop, so even landless labourers get some small share of the profits. It is more effective than aid at reaching the poor, one development worker told me. This year in Nangarhar, growing poppies is not an option. In Juma Khan's district, farmers have been arrested for breaking the ban. It has become very tough for many families. Some men spoke about joining the Taleban to make money, they pay their fighters $140 a month, or the Afghan National Army who pay rather less. Many farmers literally do not know how they are going to feed their families. They are feeling angry and betrayed. They said the government had promised aid to help them through the ban, but they have received nothing. Some threatened to break the ban next year. "Our tribe is the Khogiani," said one farmer, "and we're brave like lions, a big tribe, living on the border with Pakistan." "The government should look after poor families," he said. And they should watch out. Afghan kings have been brought down by the tribes of Nangarhar. But the man whose small daughter is now engaged, looks exhausted. His fighting days are long gone. He went into debt during the jihad against the invading Soviet army, 30 years ago. Since then, he has never managed to pay back the capital. Did he not feel any shame, I asked, about marrying off his six-year-old? No, he said, the real shame would have been to have his creditors knocking at his door, embarrassing him in front of the village. Your daughter, I persisted, how does she feel? "Oh, she's happy to be solving her father's problems," he said.